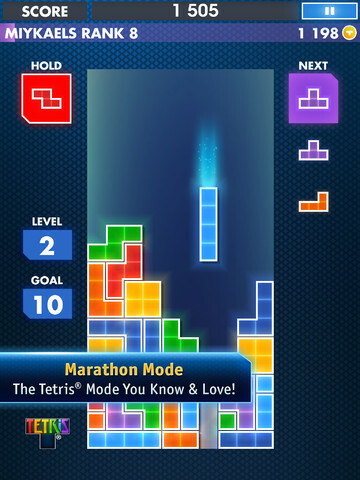 EA hopes you'll love the new Tetris...after emptying your wallet. We fell in love with Tetris the moment Nintendo released it alongside the original Game Boy in 1989. Tiny screen? Black and white graphics? Flickering images? Nothing prevented us from escaping reality (AKA long car rides with the parents) and spending several hours manipulating Tetriminos to form horizontal lines. And that theme music...as iconic as anything we've heard in games and even film. Good luck getting it out of your head. That said, this is without a doubt the best version of Tetris for the iPad, largely because it's the only version of Tetris for the iPad. Electronic Arts saw fit to nix the previous iOS title for something futuristic, which we'll readily admit looks much nicer, with slick neon blocks crowding the retina display, but it's more than just eye candy. That is, if you can recover from sticker shock long enough to appreciate it. Yes, this Tetris costs $6.99, a hefty sum for an iOS puzzle game, though when you consider the publisher involved, the price is par for the course. EA could justify the cost had the app come with a plethora of modes, similar to Tetris Axis on 3DS, but it only comes with three, and EA wants you to spend more cash. The game has in-app purchases baked into the experience. The first involves paying for T-Coins, a virtual currency that helps you unlock new planets in Galaxy mode (more on that in a bit). These range from the acceptable $1.99 to the absurd $99.99. Then, we have the T-Club, where official members score 15 percent more coins each time they play, as well as additional lines. That'll run you $2.99 per month, or $29.99 for the year. Absurd? Yes, and greedy, too. It's weird to see Electronic Arts nickel-and-diming players on a puzzle game that's been around more than 20 years, especially after charging $7 to download it. This issue, though, was a bit overblown by App Store users, largely because you don't have to spend another cent, and the game does exactly what it was designed to do: run Tetris, and do so extremely well. To that end, we definitely appreciate the effort that went into making this title entertaining. There's Marathon mode, of course, where you just create as many lines as possible before the game gets insane. 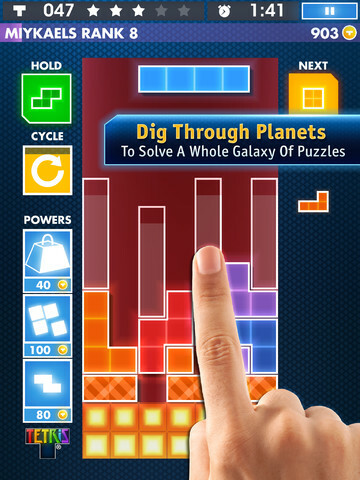 From there, we have One-Touch, a more casual-friendly mode where you're able to play Tetris with a finger, tapping highlighted "ghost" blocks to quickly drop Tetriminos into place. Finally, there's Galaxy, by far the most intriguing thing about Tetris for iPad. Here, you solve individual puzzles using as few Tetriminos as possible while earning up to five stars along the way. Keys to success involve plotting a move or two ahead as always, but also harnessing a few power-ups for that all-important edge, be it the Anvil that breaks all existing blocks in its destructive path, the Fragment that splits blocks apart and Best Fit, which exchanges one block for a more desirable one. This is ultimately where those T-Coins become somewhat important, because you need various amounts to unlock new Planets. Fortunately, you'll earn these normally from playing the game. It all comes down to how much time you're willing to invest. Grind it out, or cough up the dough? Personally, we suggest doing the former, quite simply because it's Tetris. You'll play the game like an obsessed crazy person and amass the coins naturally. With this in mind, although we admit EA's in-app stuff is a bit sleazy and the price of the app is ridiculous given the content (more like lack thereof), Tetris is a quality game that'll make you see Tetriminos in your sleep. Review code provided by Electronic Arts. What's Hot: Slick neon Tetriminos, casual-friendly One-Touch mode, strategic Galaxy mode, user-friendly touch controls, familiar albeit slightly remixed theme music. What's Not: Overpriced, too many in-app purchases, not enough modes.